For the past 10 years, Our Mission is to educate and provide the best quality air conditioning products and services. We more than satisfy our customers and coworkers, always going the extra mile. We take pride in hiring, training and retaining only the most professional HVAC experts in the industry. Many of our staff members have been with us since the beginning. We do not use temporary or seasonal workers who may not care about their work. All staff members are drug tested and background screened. 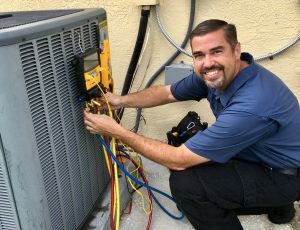 Constant training in the latest service techniques and product innovations assures that our skilled professionals will give you what you truly deserve: the most accurate advice, the highest quality installations, and the most effective service. We are ready to listen so that we may understand your needs – to design a comfort system tailored to YOU. Whatever your requirements are, you can be assured that we have the benefit of having performed this same kind of job in thousands of homes and offices, many just like yours. With this kind of experience, we know what works and what doesn’t, thus ensuring that we will do the job right the first time. Call The HVAC Experts At Complete Pro Air Today!